As a species jellies have been around for a very long time. They appeared in the oceans about 650 million years ago, before the dinosaurs. They still populate our oceans today in a profusion of sizes and shapes. Jellyfish are incredible creatures - it's amazing that they are living things. Check it out...their bodies are made up of 95% water, they have no bones or cartilage, no heart or blood, and no brain! (Talk about a real 'no-brainer'). They are one of earth's simpler and more primitive life forms. The picture you see at left is a much smaller specimen of a lion's mane jelly. The world-record holder was found dead, washed up on a beach. It had a bell over seven feet across and its tentacles were over 120 feet long. That's even longer than the blue whale. Scientists have determined that some jellies have eyes that can detect light from dark and even some movement of objects in their field of vision. It doesn't seem possible that any living creature could have eyes, but NO BRAIN. The brain is where the processing of visual stimuli happens in most higher-order species. How does the procedure work in jellies with eyes and no brains? Scientists don't really know for sure, but by studying jellies they can learn a lot about how vision works and what role the brain plays in processing visual input. The Arctic Lion's Mane, like most jellies, is a predator - it kills and eats other living creatures from the animal kingdom. (Even though water buffaloes and hippopatomi eat living things (plants), they are not considered predators.) 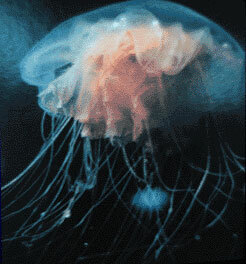 That means that this giant jelly stalks, pursues, catches, kills and consumes its prey. What does it like to eat? Fish, plankton, and even other jellies. It's pretty hard to picture a jellyfish stalking and killing its prey, but they really do (watch what fast and powerful swimmers they are in the video, at right)..
Usually, an unsuspecting fish will swim into the almost invisible tentacles of the jellyfish, which are loaded with millions of nematocysts (stinging capsules contained within cells called cnidocytes located along the tentacles). When the fish contacts the tentacles a paralyzing venom is immediately injected into the victim. Then the jelly can eat its quarry at its leisure. Lion's Mane jellies can also pursue and kill other jellies for food. But then, there are also other creatures in the sea which eat the Lion's Mane. If a human were to get stung by a Lion's Mane jelly it could be fatal, provided enough poison had been absorbed by the body. The venom can cause paralysis of the breathing muscles so the victim would die from suffocation. Don't expect to go swimming at the beach and see a huge Lion's Mane jelly - this big guy probably lived way out in the open ocean, way down deep. Many of this species of jellyfish are found in frigid, Arctic waters.